Professionally manufactured, pre-assembled hydronic heating pump panels value-engineered to simplify your radiant heat installation. Customized pump panels save time on the job by reducing on-site work to connecting the supply and return lines to manifolds, basic electrical wiring, and hooking up the make-up water supply. BlueRidge Company technicians are ready to assist you with a total system design whether it is for one room, whole house, warehouse/workshop, condominium or commercial building. 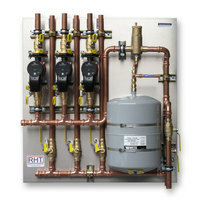 3-way-mix Add Webstone 78104W mixing valve and thermometer to panel. includes additional fittings required.